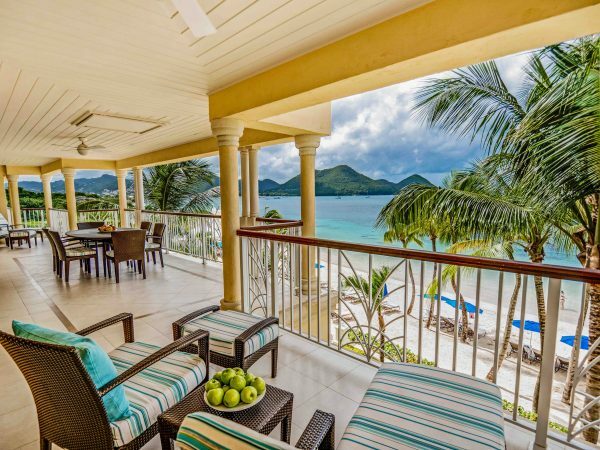 The Landings is a world-class luxury resort built right on the beach of one of the island’s most beautiful bays. Expertly designed to incorporate both a marina and 800 ft of world famous Caribbean beachfront where you can enjoy the surf and the sand with complimentary water sports. 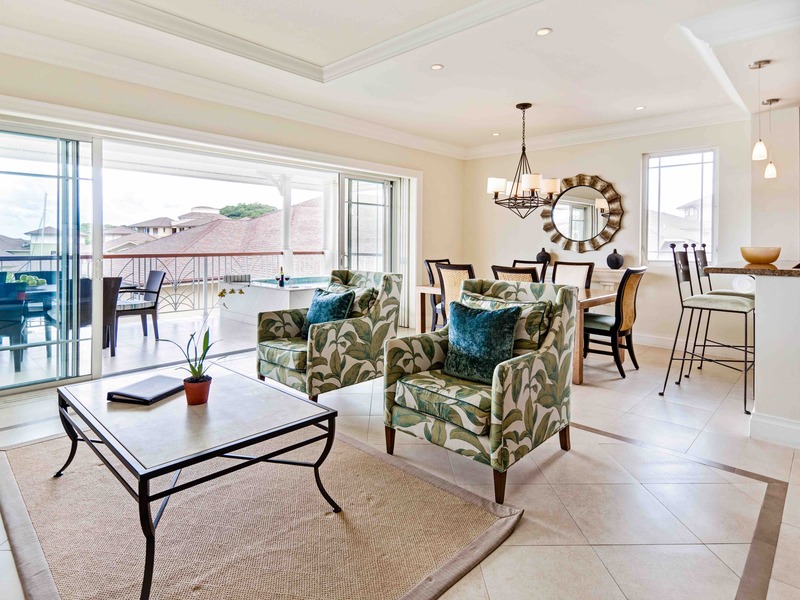 The accommodation comprises of well-appointed one, two and three-bedroom villas in a harbour-style community. 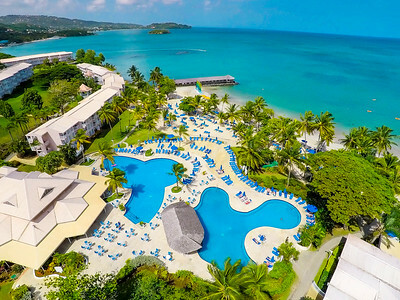 Perfect for St Lucia beach vacations, family holidays as well as romantic retreats and honeymoons. The service is attentive but not obtrusive, and you can enjoy the state of the art facilities such as a 7,000 sq-ft spa, health club and a multitude of casual and fine dining options at your leisure. Do everything or nothing at all, at The Landings there are great opportunities for exploring the island or just cosy up with your loved ones in this resort which is perfect for the discerning traveller seeking something a little bit special. Comprised of 72 spacious and comfortable villa suites with great views out over the harbour and marina or the beach and the Caribbean Sea beyond. 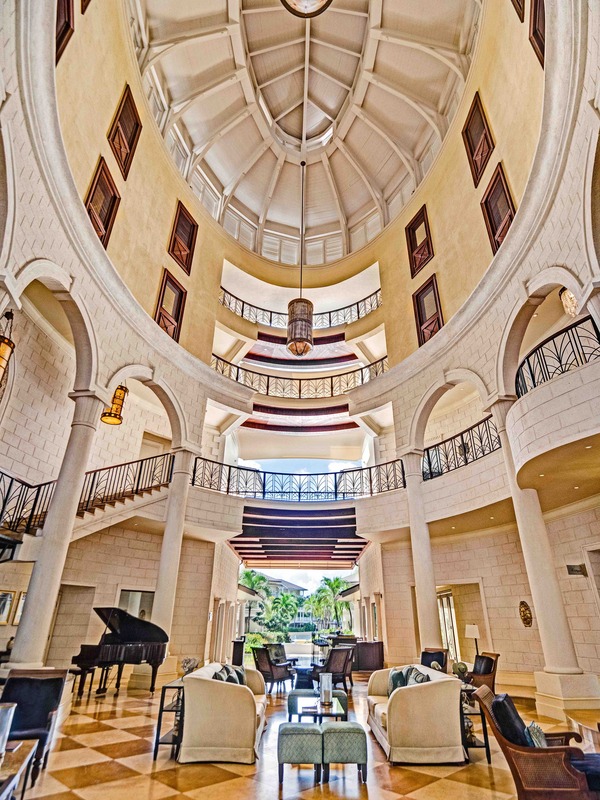 Each is designed with luxury in mind, and there are lots of little details to compliment the Tuscan mosaics, mahogany furniture and hand-rubbed paintwork. Rooms on the ground floor have good wheelchair access. All rooms feature a full kitchen, spacious living room with flat screen TV and CD player, high speed internet and large terraces or patio spaces. Some suites even have an indoor plunge pool with Jacuzzi-style jets. 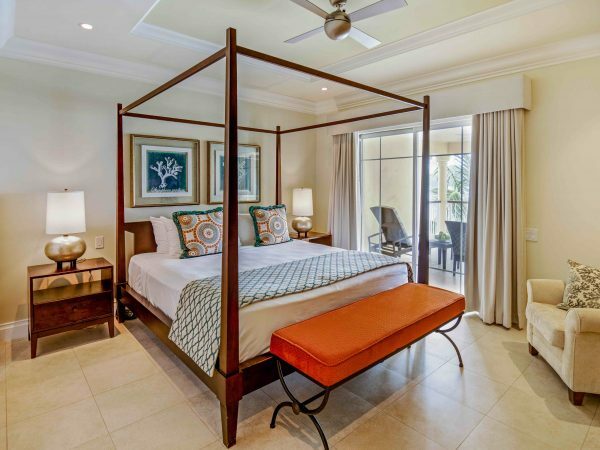 One-Bedroom Villa Suite – Harbour View – These beautiful suites are on the ground floor and come complete with their own Jacuzzi-style plunge pools. 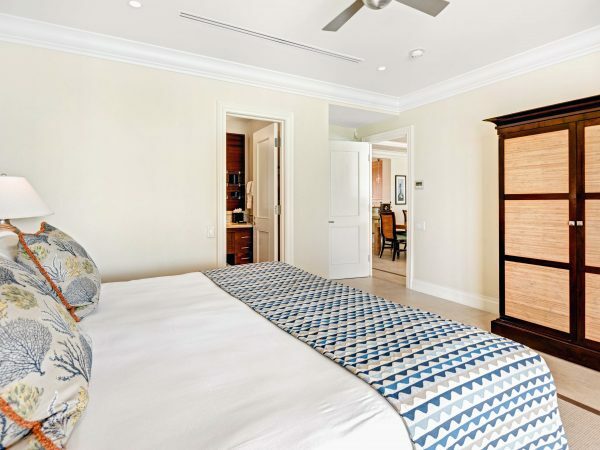 Spacious and comfortable, the suites comprise a master bedroom with dedicated en-suite, living area and dining areas, full kitchen and a terrace overlooking the harbour. They sleep up to 2 people in a king size four poster bed. Two-Bedroom Villa Suite – Harbour View – These two-bedroom suites overlook the harbour from either the ground or second floor and feature a second guest bedroom with in addition to the spacious master bedroom. Both have dedicated en-suite bathrooms. Some feature private plunge pools. They sleep 2-4 people in a king four poster size bed and two twin beds. Three Bedroom Villa Suite – Harbour View – Spacious offerings and great for families with a master bedroom and two guest bedrooms, all with en-suite. Generous living areas, a full kitchen and balcony mean ample space to enjoy your surroundings. The sleep 3-6 people in two king size four poster beds and two twin beds, with space for extra cots. Three-Bedroom Penthouse Suite – Harbour View – The last word in comfort and luxury, these lavish accommodations comprise of a master bedroom and two guest rooms all with en-suite, spacious living/dining area, a full kitchen and large balcony overlooking the marina complete with a private plunge pool. The views extend over the marina area and they sleep 3-6 people in a king size four poster bed, king size bed and two twin beds with space for children in cots and/or rollaways. One Bedroom Villa Suite – Ocean View – Spacious suites overlooking the ocean, these are perfect for small families and located on the ground and second floor. They feature a master bedroom with en-suite, and some have their own plunge pool. They sleep 2 people in a king size four poster bed with space for children in cots or a rollaway. 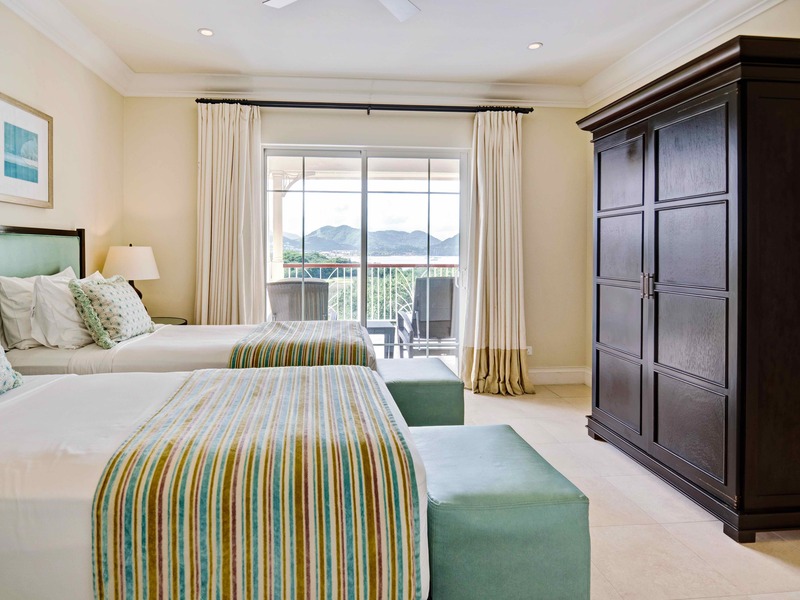 Two Bedroom Villa Suite – Ocean View – Spacious suites overlooking the ocean, these are perfect for families and located on the ground and second floor. They feature a master and guest bedroom, both with en-suite, and some have their own plunge pool. They sleep 2-4 people in a king size four poster bed and two twin beds. Three Bedroom Villa Suite – Ocean View – Oversized and lavish, these suites overlook the sparkling Caribbean Sea and comprise of a master bedroom and two additional bedrooms, all with en-suite, spacious living areas, a full kitchen and large balcony. They sleep 3-6 people in two king size four poster beds and two twin beds, with space for extra cots. Three-Bedroom Penthouse Suite – Ocean View – The last word in comfort and luxury, these lavish accommodations comprise of a master bedroom and two guest rooms all with en-suite, spacious living/dining area, a full kitchen and large balcony overlooking the marina complete with a private plunge pool. The views are spectacular, showcasing the azure blue waters of the Caribbean. They sleep 3-6 people in a king size four poster bed, king size bed and two twin beds with space for children in cots and/or rollaways. Two Bedroom Villa Suite – Beachfront – Great for families, these villa suites are situated steps from the white sandy beach and have a master bedroom and guest bedroom, both with en-suite. Located on the ground and second floors, some have their own plunge pool. They sleep 2-4 people in a king size four poster bed and two twin beds. Three Bedroom Villa Suite – Beachfront – Extra living space and two guest bedrooms in addition to the master bedroom (all with en-suite) along with a full kitchen makes these suites great for families. Stunning views across the beach and the sea beyond can be admired from the large balcony. They sleep 3-6 people in a king size four poster bed, king size and two twin beds, with space for extra cots. Three-Bedroom Penthouse Suite – Beachfront – The last word in comfort and luxury, these lavish accommodations comprise of a master bedroom and two guest rooms all with en-suite, spacious living/dining area, a full kitchen and large balcony overlooking the marina complete with a private plunge pool. The views are spectacular, showcasing the pristine white sandy beach and the azure blue waters of the Caribbean. They sleep 3-6 people in a king size four poster bed, king size bed and two twin beds with space for children in cots and/or rollaways. *We also have some rooms with plunge pools. Food at The Landings represents the people and the landscape of St Lucia – varied, interesting, generous and flavourful. Local ingredients are used and given a true international flair. For those who would like something more familiar there is a great selection of continental dishes and comfort foods like salads burgers and pizza. Breakfasts can be continental and light or robust and local, with light fare served through the day. Lunches are delectable offerings with mats and vegetables teeming with flavour. Dinner is all about the ambiance, and there is a selection of steaks and seafood to choose from. Children are well catered for too, with a selection of vegetables served with home favourites. The Palms Restaurant – A great beachfront restaurant offering a wide selection of fresh and exciting fish and seafood creations. Taster menus are also on offer throughout the year. Open for dinner on Thursdays, Saturdays and Sundays 6:00pm – 9:30pm. 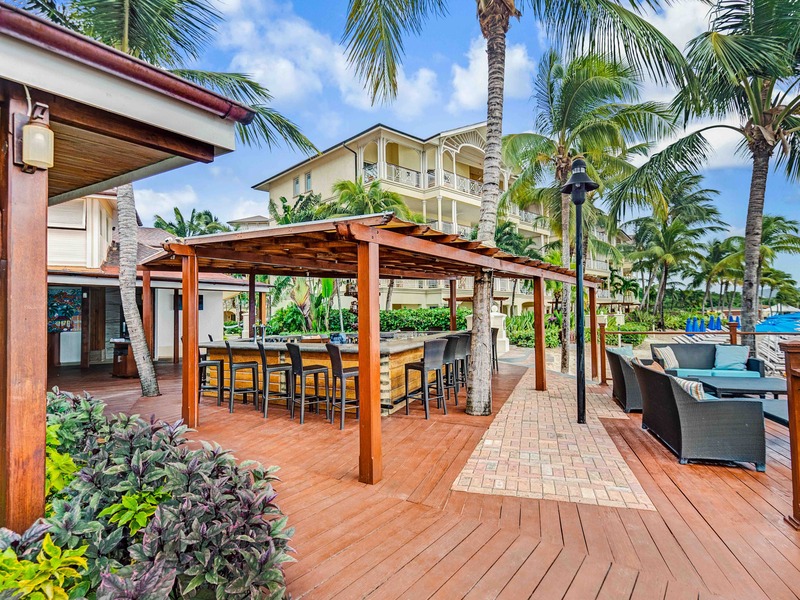 The Beach Club – A great setting for breakfast, lunch and dinner right on the beach. A dramatic backdrop is provided by the ocean, the sand and the shifting colours as the sun sets on another perfect day. 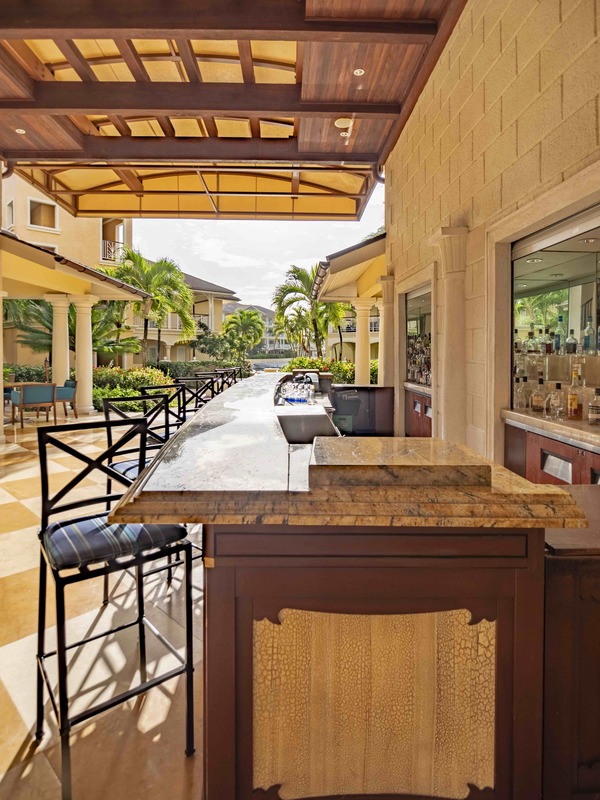 As the focal point of the resort it is a great place to relax and has an informal setting as well as a full bar. There is also a happy hour with 50% off drinks on Tuesdays and Thursdays, as well as on Fridays for 3 hours in the evening. It is open daily 7:00am – 11:00pm. Mondays – Latin Heat: specialising in favourites from South America including Caipirinhas, Mojitos and Margaritas. Wednesdays – Parisian: a piano bar with servings of Piper Heidstick champagne, canapés and petit fours between 6:30pm – 9:30pm. Fridays – Martini Night: we’ll make you any kind of martini you like from a wide variety of firm favourites and premium spirits and liquors. All served with chocolates and truffles at the bar. 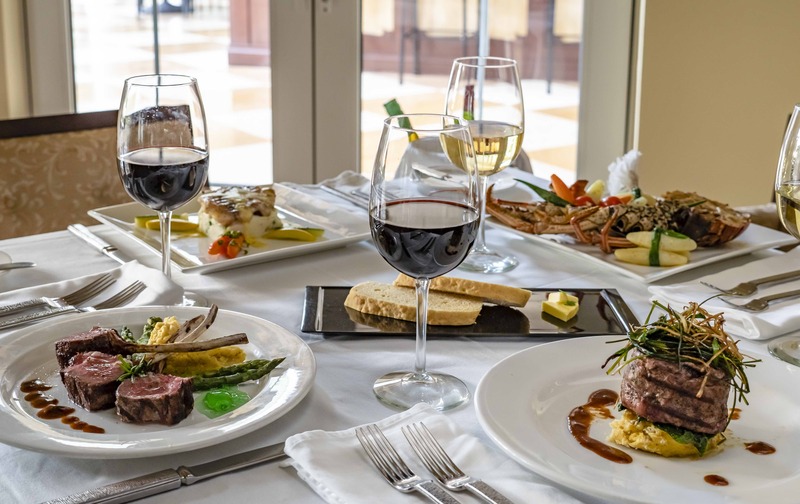 Saturdays – A Taste of Italy: A truly Italian themed menu is on offer at The Palms with wines expertly paired, as well as Italian wines and of course Prosecco served in the lobby. Private Dining – if you would rather dine in the comfort and privacy of your suite, one of the 8 highly trained private chefs will gladly prepare for you a meal you will never forget – be it a romantic evening for two or a family feast, nothing is too much for the culinary staff at The Landings. The Landings is fast becoming famous for its pristine sandy beach as well as its excellent facilities and things to do. Perfect for sunbathing, with endless crystal clear waters for swimming, the beach and its associated water sports are a huge crown-pleaser at the hotel. You can enjoy sailing, kayaking, snorkelling and scuba diving, deep sea fishing, sunset cruises and other equipment for your enjoyment (some of these attract a fee). Back on land there are two floodlit tennis courts with complimentary use and racquet hire for residents (tennis balls are $10 a sleeve) as well as the services of Dean White, a professional player of 25 years experience offering lessons and coaching. Golf is also available nearby at an 18-hole championship course, with course prices for 9 and 18-hole as well as equipment rental if required. A well-equipped fitness centre is open 24 hours a day 7 days a week and is complimentary for guests. With a range of cybex equipment suitable for both resistance work and cardiovascular exercise, as well as fresh towels and of course air-conditioning. The exquisite Soleil Spa is a great place to unwind, with an extensive range of packages and treatments available in one of 8 dedicated treatment rooms (one exclusively for couples) as well as hair and beauty options in a full-service hair salon. The ingredients and products used as well as the methods are all derived from the island and its influences are evident everywhere. You can opt for a classic massage, a body wrap or a facial, as well as manicures and pedicures. There is something for everyone, including men and younger guests to enjoy. The recent addition of The Landings Kid’s Club to the extensive list of facilities means there is now even more to do for those travelling with families, with a rang of fun and educational activities on offer. Open daily 9:00am – 5:00pm it is a great place for kids to enjoy themselves and make new friends in their own personal escape. The kids club is suitable for all children over the age of 3 who are potty trained and its use is complimentary for guests. There are treasure and scavenger hunts, beach and pool games, competitions and colouring contests, arts and crafts as well as educational activities and dancing. All of this is organised and run by Carol Thimmingham who has been coordinating children’s programs at resorts in St Lucia for over a decade. This ensures that the children are kept entertained and the grown ups can have a little time to themselves around the resort during the day, or maybe venture out on an excursion or into nearby Rodney Bay. Up to 2 children under the age of 12 may share for free with adults in any of the villa suite accommodation, and infants under 2 are always complementary in cots. The Added Value Family Offer includes 3 hours of free babysitting for one evening a week for up to 2 children aged 1-8 years old, as well as a weekly picnic adventure treasure hunt at Pigeon Island National Park. Sailing and kayaking are also suitable for older children and lessons are available.